The worst possible situation unfolded for the Green Bay Packers last Sunday afternoon, against the Minnesota Vikings when they received a devastating blow, discovering that their Superhuman quarterback Aaron Rodgers is likely out for the season. We can break this down so many ways but let’s touch on the positives that are with the Packers currently. Firstly, most teams around the NFL would sign up for a 4-2 record after six weeks. 4-2 is a decent start no matter how easy your schedule has been. Secondly, there’s the fact that QB play has been a mainstay in Green Bay for two-plus decades. That is something that every team would have signed up for that the Packers have luxuriously enjoyed. Maybe Green Bay was due? The bad karma struck North America’s smallest sports franchise for the first time. However, Packers fans have been down this road before and both times it’s worked out well. First, in 2010, Rodgers was knocked out in a game at Detroit that almost derailed their playoff chances. They ended up losing that game 7-3. The next week, Matt Flynn faced the impossible task of beating the Patriots in New England on Sunday Night Football. He almost pulled it off, falling short on the final drive. The next week, Rodgers came back and started a run of 19 in a row, including a Super Bowl XLV win. The other time was 2013, where Rodgers missed seven games and the team went 2-4-1. That record was good enough to keep Green Bay in the playoff race until his return where he starred in a divisional title-clinching game in Chicago. In fact, the following year, Rodgers came back strong, returning to the NFC Championship game. I’m not ready to admit the season is lost for Green Bay. The Vikings have their own injury concerns, and the rest of the NFC is way too jumbled up right now to say that Packers’ playoff chances are next to nothing. However, at this rate, 9-7 might be good enough to sneak into the final playoff spot. Therefore, Green Bay would have to be at least 7-7 by Week 16 to have any hopes of making it. The irony is though, that to get to 7-7, Green Bay would have to go just 3-5 in their next eight games, which should be plausible considering Green Bay is 3-5-1 without Rodgers since he inherited the starting QB position from legendary QB Brett Favre in 2008. When looking at it, it’s honestly a feasible schedule outside of trips to Pittsburgh and Carolina. If Green Bay can go 3-3 in the next six then that would get them to 7-7. 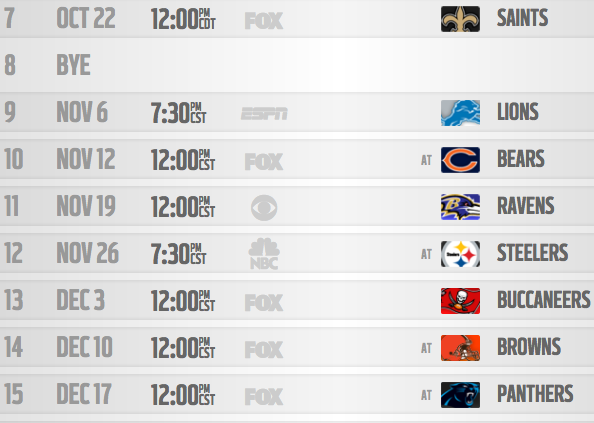 Again, I’ll stress that 7-7 would be enough for the Packers to still be in the hunt in the final two weeks. As a matter of fact, the only way 7-7 wouldn’t be enough is if the 5th and 6th playoff spots are both 10-4 and the leader of the NFC North is 10-4. Looking at the standings, those outcomes would be really unlikely. It doesn’t look like the Packers will dip into free agency to find a quarterback. Brett Hundley is their Mike McCarthy’s guy down the stretch. In the end, the injury will likely cost Green Bay a bye, however, writing off the Packers completely is a setup for failure.